Save up to 20% off when you book early. Applies to 2 night stay at participating hotels. Special conditions apply. Ages may vary between countries. See site for details. Applies to participating hotel properties. With special offers and packages. Find a lower internet rate, get a free night. After a long drive through the countryside, all you want is a habitable motor inn. The Choice Hotels network includes Quality Inn, Comfort Inn and Suites, Sleep Inn, Clarion, Cambria Suites, Mainstay Suites, Suburban, Econo Lodge, Rodeway Inn, and the Ascend Hotel Collection. Use a Choice Hotels coupon code to save even more on affordable and comfortable hotels. When the sandman says it’s time to hit the sack, choose Choice Hotels for your restful repose. The Quality® difference assures guests they will have premium bedding, hot breakfast, a refreshing shower, friendly service, and complimentary amenities. The world’s largest hotel chain by room includes Ascend Hotel Collection, Cambria Suites, Comfort Inn, Clarion, Econo Lodge, Mainstay Suites, Rodeway Inn, Sleep Inn, and Suburban. There are economical rooms and deluxe suites for every price range and journey. And, over 5,500 Choice Hotels around the world, in regions such as Asia and the Pacific, Canada, the Caribbean, Central and South America, Europe, the Middle East, Mexico, or the United States. Don’t forget about the special incentives to book at Choice Hotels online, like special rate programs, traveler programs, and hotel deals. To qualify, simply sign up for an Online Account, or opt for the Choice Privileges Account. All Choice Hotel members enjoy benefits such as online reservations, airline earning preferences, and stored personal information. Privileged members have access to earning points that can be applied to free nights, gift cards, or airline rewards. The history of the corporation dates back to 1939, when seven motels in a sleepy Maryland valley formed a loose system of referrals. At the time, the average price of a hotel room in the US was $3.21 per night. They officially formed Quality Courts United, Inc., in 1941. In the early 1950s, Quality Courts was the first to offer luxuries such as telephones, plush carpeting, and daily maid service. In the Seventies Quality Courts became Quality Inns International. They expanded their operations to Europe and Canada. During 1990, they changed their name to the familiar Choice Hotels International. Choice Hotels International makes four points of corporate social responsibility: Room to Give, Room to Rebuild, Room to Be Green, and Room for Everyone. They train thousand of hotel employees to know the signs of human trafficking, as part of a company wide Human Rights initiative. The majority of their locations collaborate with the National Center for Missing & Exploited Children (NCMEC). So if it’s slumberland that you seek, choose a Choice Hotel for yourself and the whole family. Your dreams have come true in the form of quality inns and hotels. Get forty winks and even save forty dollars with Choice Hotels coupon codes. Choice Hotels patrons earn all sorts of extras and goodies, like gift cards, free nights, and even airline tickets. 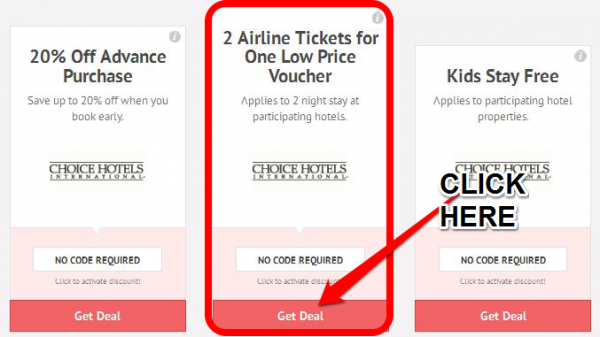 There is a right way and a wrong way to use a Choice Hotels coupon code. This is the right way. Step 1) Look for a coupon code. 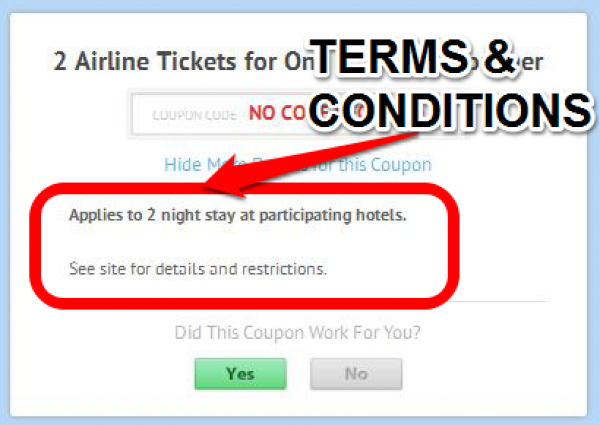 It never hurts to check for a coupon code when you’re booking travel arrangements. So I navigate to the Choice Hotel profile at CouponPal by doing a search. 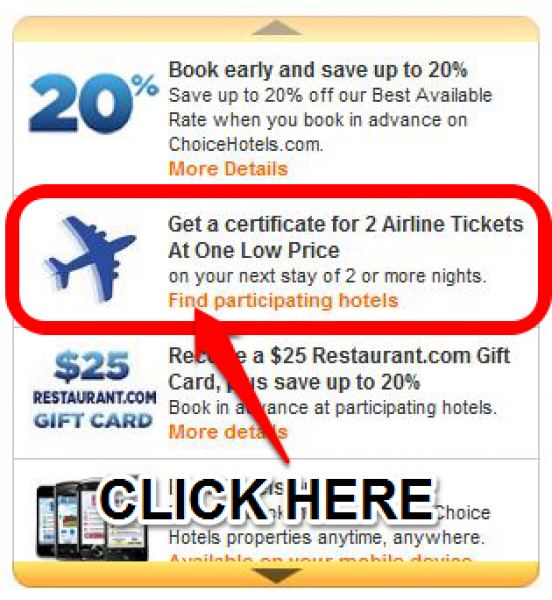 Step 2) Click on the Choice Hotels coupon code. Who could resist free plane tickets? I’m hooked. I click on the coupon code to activate the deal. Note that there may be additional details and restrictions from Choice Hotels. Step 3) Find a qualifying hotel. 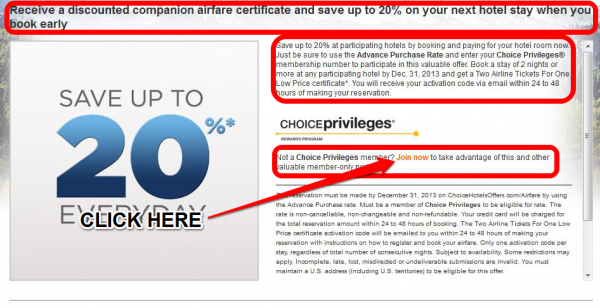 On the homepage for Choice Hotels, there is an offer matching the one on the coupon. 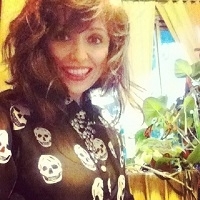 I use this link to search for a qualifying hotel. Step 4) Join Choice Privileges. This is what I was talking about when I said details and restrictions. After I select a city, I am prompted to join the premium reward program, at which point I will qualify for the offer. Step 5) Fill in personal information. It’s fast and free to join, but I will have to enter my credit card information. Don't worry, this is a trusted service. I won't be charged, that is how hotels confirm reservations these days. Soon I will qualify for the sweet, sweet airline tickets. I mean, if I book two or more nights at a participating hotel! Save money of your stay at Choice Hotels by booking online and ahead of time. Choice Privileges members earn bonuses, like gift cards, airline miles, and free nights. The friendly and professional customer service at Choice Hotels is one of their main selling points. So they don’t mind answering your frequently asked questions. How does one join Choice Privileges? You can apply to Choice Privileges using the easy online application form. You will have to submit your credit card information for consideration. Approval is practically instantaneous. Will my credit card be charged if I join? Membership in Choice Privileges is free. Your credit card is used to confirm reservations. Are there blackout dates for rewards? There are no blackout dates for the use of Choice reward points. Who are the participating airline partners? The participating airlines include Aeroplan®, airberlin topbonus, Air New Zealand Airpoints, Alaska Airlines Mileage Plan, American Airlines AAdvantage®, Club Premier® (400 kilometers), Czech Airlines OK Plus, Delta SkyMiles®, FREE SPIRIT™, Qantas Frequent Flyer, United MileagePlus®, US Airways Dividend Miles®, Velocity Rewards. Restrictions may apply in Eastern or Northern Europe. What if my stay is not showing up online? You can report a missing stay by signing into your online profile. What is the Best Internet Rate Guarantee? If you find a lower price on the same hotel you book, within 72 hours of your stay, you can submit an online claim. If approved, Choice Hotels will honor the lower price. This offer is not valid if you change your reservation. How do I Use Choice Hotels Gift Cards? Choice Hotels Gift Cards are good for stays at Choice Hotels. Gift Cards that were purchased online cannot expire. Gift Cards that are won through special promotions do come with an expiration date. Be sure to read them carefully. To find a location that accepts animal guests, search under the Pet Friendly page. Do they accept group reservations? If you need ten or more rooms, please make your request through the Group Reservations Page.